2013 Ponzi Tavela Pinot Noir – The 2013 Ponzi Tavola Pinot Noir is produced from LIVE Certified Sustainable Ponzi Aurora, Avellana and Madrona Vineyards, as well as sustainably-grown vineyards in the Dundee Hills, Yamhill-Carlton and Eola Hills AVAs. Round 2 of “Friday Night, Flight Night”! In case you missed it last week– we will be doing a Flight Night event every Friday in place of our normal happy hour. 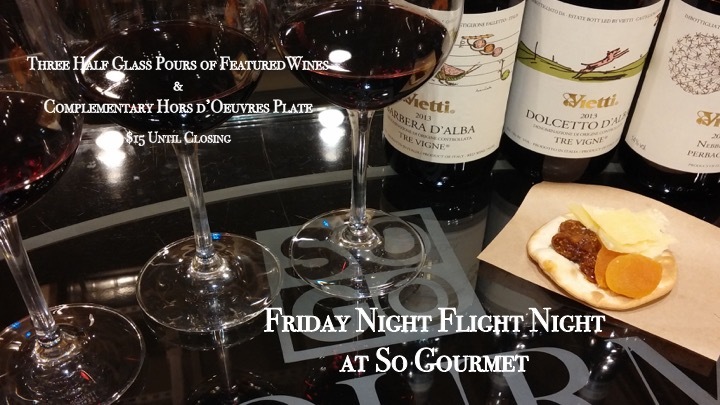 $15 per person will include 3 half-glass pours of featured wines (or house selections if preferred), and a complimentary gourmet hors d’oeuvres plate. Come join us at the tasting bar or hang out with friends on one of our two terraces overlooking Palafox or Main St. prior to dinner or other evening plans downtown! Last week was lots of fun, so we look forward to seeing you this week! Can’t wait for Friday Night Flight Night tomorrow!